DN Decorations Ltd undertook the complete painting and decoration package for this award winning house in Buckinghamshire. This is a rare example of a poetic narrative whose realisation remains true to the original concept. The site is a seam of flint geology surrounded by ploughed fields with the flints sitting on the surface. 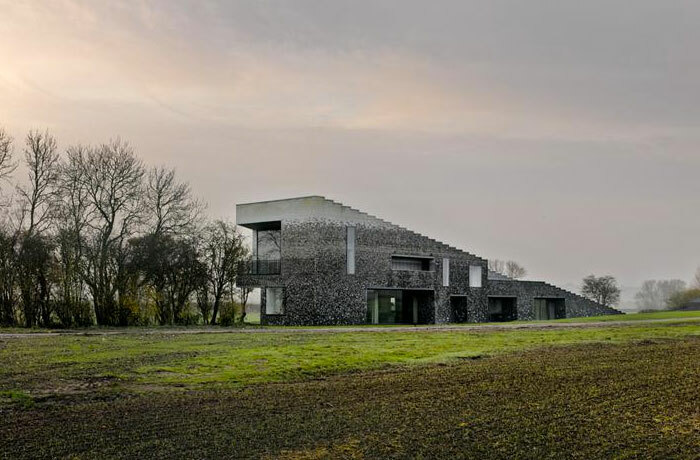 The project is conceived as two wedges of that geology thrusting up through the flat landscape. Their bases are knapped flint and slowly change in construction and texture until they become chalk walling, dissolving into the sky. The house forms accommodation for family members, guests and artists. Internally the spaces carefully frame the landscape and provide a rich sequence of experiences, including a small rivulet of water that that cuts a grotto through a corner of the main house. Magic.